I bought productivity bible Getting Things Done two and a half years ago. This week, I reached page fifty. Impressive, huh? You must be wondering: “What is the secret of his productivity success?”. Well, dear reader, I’m going to tell you. For the last couple of years I’ve been a using an ‘above top secret’ personal productivity tool. I now believe the time is right for others to benefit from its unique insights. utter genius! I have just set this as my background. Mind you, if I had had it before I may never have discovered it…. Argh! I am trapped in a paradox. Love it 🙂 Started using it straight away. Recommended on my blog. Keep it up! 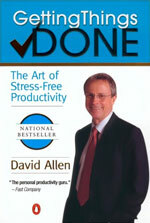 50 pages of the David Allen book is good going…. I found it one of the most boring books I have ever read, which is in stark comparison to Bryan Tracy’s ‘Eat that Frog’ book which can be read in a couple of hours, is inspiring and the method works pretty well too. Why is it that reading my will makes it some more efficient than just remembering it ? Great wallpaper! I think it will be more useful if the text runs along on the right side of the screen, i.e. using right-aligned margin. Thanks anyway, use it at my office computer desktop.